The recent spell of good weather has seen a concerted effort on de-rusting the various parts of the cab and getting some primer on to the surfaces. Despite a lot of energy being expended on the ends of the taper boiler barrel another session is needed on the small end in order to enable the end of the parallel section of barrel to fit inside. It has taken longer than originally anticipated to commence the machining of the horn guides of the chassis with the hired horn facing machine. We have had to make machined packing blocks to set up the machine at a suitable distance from the work face and make machined out riggers to hold the mirror of the optical alignment equipment on the bed of the machine followed by much checking of the set up with the optical alignment equipment. 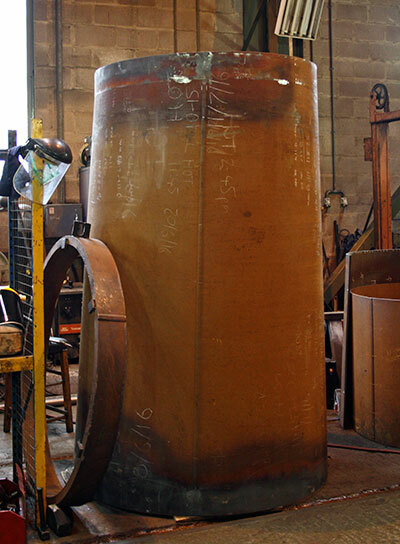 Machining of the steam chest liners continues and various castings in storage are going out to sub contract machining to avoid a lengthy machining queue building up. 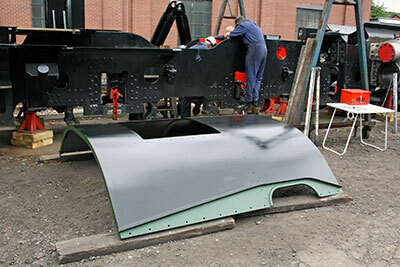 South Devon Railway Engineering have completed their work on the pony truck wheelsets. As readers of SVR News will know, the most recent issue of the magazine was something of a tour de force for 82045, as it carried an article, an appeal leaflet and a book of raffle tickets in aid of the loco's crossheads and slidebars. It is still too early to give an accurate estimate of the results, but the signs are encouraging: Barbara reports a good number of new members resulting from the leaflet (we are now at 750), and I understand that the revenue from the Guarantee Company's raffle is already very well into five figures, with money still coming in. 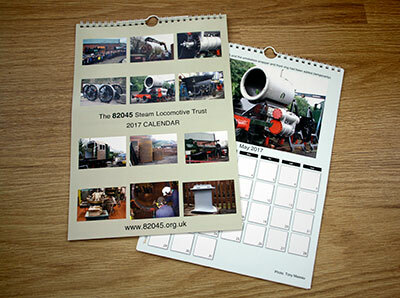 On behalf of the Trust, I would like to express our thanks to everyone who has contributed so far to what looks to be shaping up for a splendid outcome; also to the SVR Guarantee Company for its continuing support; and last but not least to SVR News Editor David Williams, who has done us proud, as he always does. We are very conscious of the fact that he has a large number of worthy competing claims on his editorial space, so, once again, thanks so much, David. We also haven't forgotten the important role he played in the early days - when we were widely thought of as an object of embarrassment, if not of derision, both off and on the SVR - in giving us his enthusiastic support and describing 82045 to his fellow Board members as "a breath of fresh air". On the general subject of fundraising, I am amazed at the generosity our supporters have shown over the years, especially since the arrival of the frames at Bridgnorth shortly before Christmas 2008. Thanks to all of you, 82045 is one of the most respected of the many current new build locomotive projects, and this despite the fact that it is a mundane tank engine with no evocative name to pique the public's interest. I think our helpful webmaster Paul Bennett's slogan Practical Steam for the 21st Century sums it up best. Don't you dare delete this, Paul - I wish I'd thought of it! Tapered boiler barrel. The change of shape of the small end can be seen at the top left area of the barrel. Photo: Tony Massau. The draught screen bulkheads for the inside of the cab. The large one is situated behind the driver’s seat and the small one behind the fireman’s seat. Photo: Tony Massau. 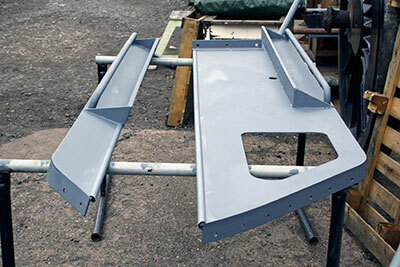 The cab roof in primer and already looking more presentable than hitherto. Photo: Tony Massau.